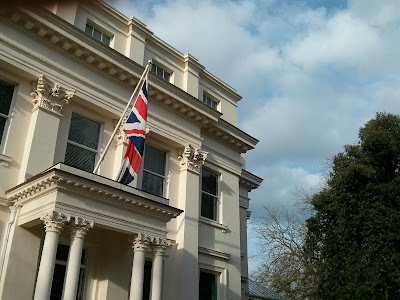 When I was in Cheltenham last weekend, I wasn't there for the races. I'd actually forgotten they were on, which is why I was so confused about the rapidly increasing flight fares. I've never had any interest in horse racing. It's one of those things that I don't believe should be counted as a sport, due to its cruelty. Ridiculously small men balance on the back of a horse they beat mercilessly. And at the end, the horse end up with squat. Really, it's just lucky if it doesn't get shot. Don't get me started on boxing. Anyway, I had nothing to do with the world-famous races. I would mostly be in one of the villages on the outskirts, when I wasn't shopping for wedding dresses in the town itself. But on the Sunday, the dress shopping was done, and it was time for a treat. My friend, the bride, had booked us in for an afternoon treat at the Montpelier Chapter hotel in Cheltenham. We would have a massage, a steam and finish up with afternoon tea. What thrilled me the most is that the package is called the Afternoon Delight. Actually, what really thrilled me the most is the fact that song came on the radio in the car when we were only minutes away. The spa is in the depths of the hotel, quiet, warm and womb-like. The relaxation room is particularly nice, curved in shape with wood panelled walls. Around the sides were amazing couches, which you could slouch back into comfortably. We changed into our robes for some herbal tea, before the first few of us were called in for treatments. I'm a bit fussy when it comes to massage. And it pains me to say that I didn't particularly enjoy my own treatment. The others all loved theirs, so I may just be difficult to please. Also, my treatment wasn't 30 minutes, as advertised. It was 25 (there was a clock in the room). Really, I should have followed my own advice and gone for the facial. You can't really go wrong there. Massage is trickier to get right, at least for me. Before and after my treatment I had a steam, something I always adore, particularly in the winter months. The benefits of steaming stay with me for ages. My skin glows, my back relaxes and if I've any hint of a cold, it's calmed. 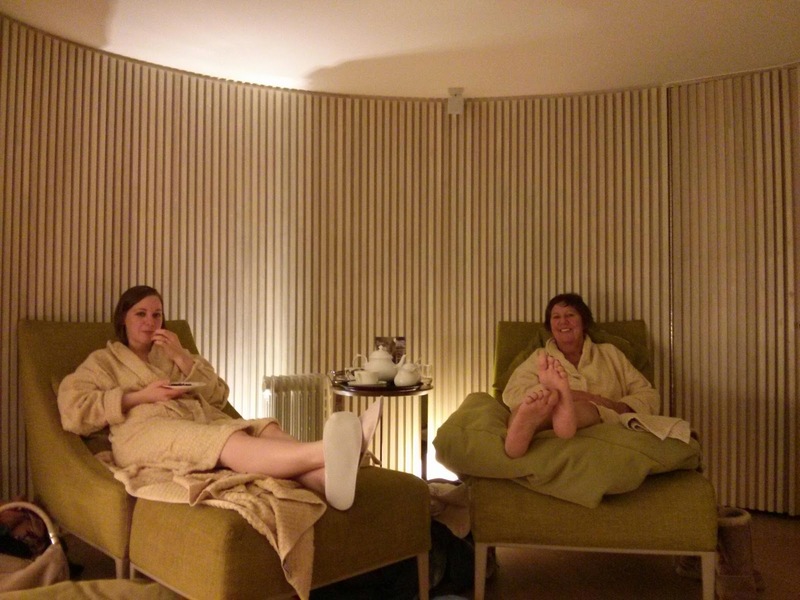 We had the spa to ourselves when we booked in, which must happen if more than four of you book in. There were five in our party, and it was nice to have the run of the place. 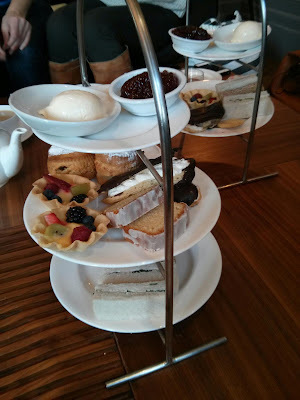 We each had a selection of sandwiches (cucumber, smoked salmon and ham), a scone with clotted cream and jam, fruit tart, lemon drizzle cake and shortbread. And plenty of earl grey. I reached my limit when it came to the scone, I'm afraid. I also only ate the fruit from the tart, and tried to sneak the plain pastry onto my friend's plate. I did utilise the jam, though - that was smeared on my lemon drizzle. YES. It seemed a popular place to be on a Sunday. And my, everyone was fancy. We really let ourselves down on that front - we looked rather red faced and scruffy after emerging from the spa. Everyone else was immaculate. The dining area was full of low slung tables, stuffed bookshelves and plump leather couches, upon which I saw a man taking an afternoon snooze, his legs slung over his companion, who was reading a book. It was such a wonderfully relaxing sight, and if I hadn't been so worried about scaring the life out of them I would have taken a picture. For a rather jazzy hotel, this package offers amazing value. The Afternoon Delight is £35, including herbal tea, use of the relaxation and steam room, a massage/facial and the afternoon tea. A massage alone is usually £30, and the tea £11.95pp. So you'd be mad not to do the two together.